Welcome to Destination Nepal Tours and Travels home page. We hope it will become the home to your travel needs especially in Nepal and other countries India, Tibet and Bhutan. Our services include all kinds of travel Management & package tours, trekking & mountaineering. Destination Nepal Tours and Travels Pvt. Ltd. (DNTT) http://www.dntt.com.np/ was incorporated in Nepal in 2008 as the leisure arm of Global Tours & Travels. Destination Nepal has grown from an initial staff strength of 6 to almost 15. Together with Global Travel (specialists in tour & travel management services to corporate clients), we now have about 50 staff and annual turnover of almost NPR 50 million. Destination Nepal believes in building up its list of SATISFIED CUSTOMERS and delivering what she and her staff promises, hence the tag-line “Reliable Holidays Worldwide”. The agency has a full-fledged operation handling personalized trekking, special interest tours, ticketing, safaris, white water rafting, cultural tours and incentives, meetings, and convention events. We also specialize in tours to Bhutan and Tibet and have started an outbound operation from the beginning of the establishment with tours to Europe, India, and China. Home to the mother of universe: Mount Everest and the great mountaineers, for some it’s the land of brave Gorkha soldiers, others love it as the only Hindu kingdom or the birthplace of Lord Buddha. For whatever reason one love the country, Nepal is the land of tremendous beauty and diversity. The elevation ranges from 70m above sea level: Kanchan Kanan to 8848m above sea level: The world’s highest point – Mount Everest. The unique variation has given Nepal a varied ecosystem, thick tropical and alpine forests swarmed with diverse wildlife, great peaks of the world, frozen valleys, deep gorges, mysterious canyons, fast and furious rivers, running hills and cool and calm lakes. Nepal is a land of temples and gentle people. Despite the many hardships, we have not yet lost our smile. We would like to thank you for coming to be with us. Once again, we welcome you. Destination Nepal Tours & Travels Pvt. Ltd. When a Tunisian truck driver launched an ISIS-inspired attack on July 14th in Nice on the French Riviera, he didn’t just mow down 84 people, he widened a wound in the global economy. Now, no tourist destination appears safe after the attack on the boardwalk in Nice, a glamorous and family-friendly seaside city popular with tourists from all over the world. 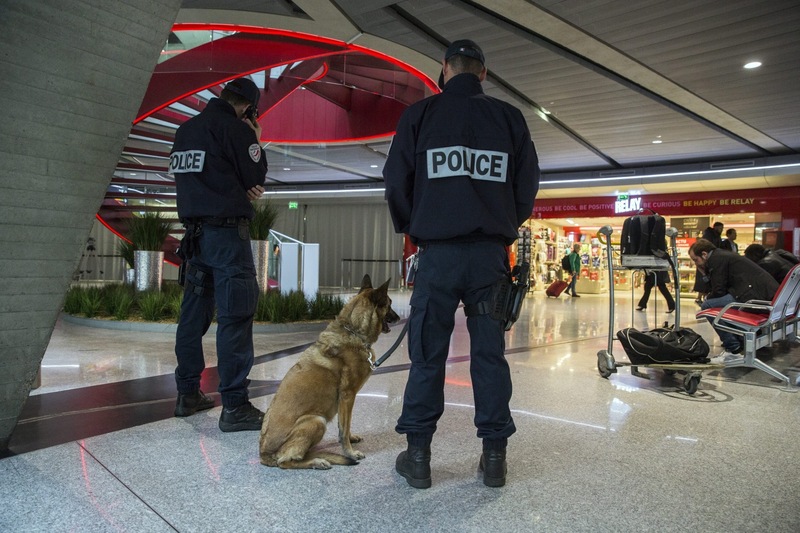 While full of “soft targets,” it broke from the recent pattern of terror attacks in Europe. As ISIS has lost its physical territory, there have been an uptick in attacks in Western Europe for which the group has later claimed responsibility said Alex Kassirer, a senior counterterrorism analyst at the global security firm Flashpoint Intelligence and an NBC News consultant. The increased cadence in terror attacks targeting European tourist destinations both major and minor has dealt double-digit blows to travel, with global tourism spending down 14 percent in June, according to a recent report by UBS. In the immediate aftermath of the Nice attack, cruise lines canceled trips and ports of call to the city. Rihanna canceled a concert scheduled for the day after the attack, and the prestigious annual Nice Jazz Festival canceled its four-day event. Nice is the second most populous city of the Provence-Alpes-Côte d’Azur region. A government spokesman declined to comment on the attack’s impact on tourism. 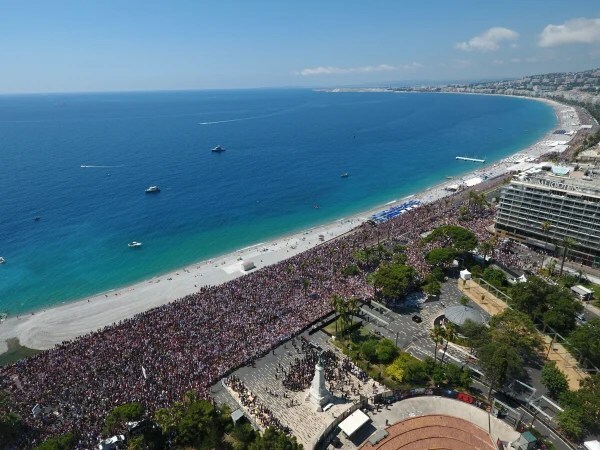 But it’s clear that in Nice, as seen in other targets of terror, tourism will suffer. Across the board, fearful tourists are canceling or changing travel plans to avoid attacked cities and countries. 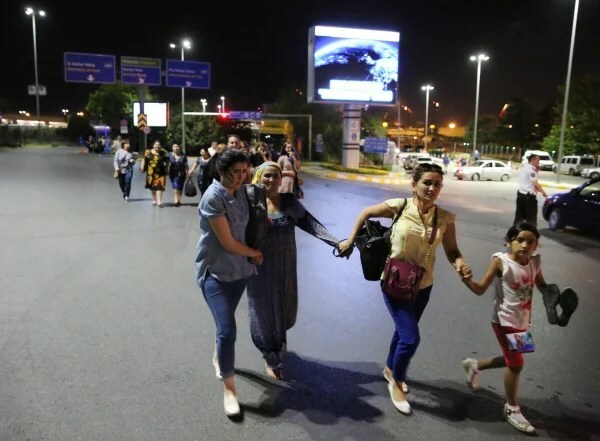 Egypt, France, Tunisia, and Turkey have all seen drops in visitors from 11 to 20 percent following terror attacks, some of which specifically targeted tourists. 31-year-old travel entrepreneur Jared Kamrowski said that he initially stuck with his plans to visit Turkey following a terror bombing there in January 2016. “We told ourselves we weren’t going to let the terrorists win by canceling our plans,” he said. But, after another bombing there in March, he did cancel his plans, opting to visit Dubai and Spain instead. Many travelers are avoiding mainland Western Europe entirely, switching to places seen as safe, like Scotland, or Latin America. Esther Roskam, a 31-year-old law student from Baltimore, Maryland, was discussing with her friend whether to take a trip to Amsterdam because of terror concerns. Besides the general miasma overhanging Europe, there had been an attack on the Amsterdam to Paris high-speed train in August 2015. Some travelers even prefer what they say is the relative safety of Western Africa. Valerie Bowden, a 28-year-old American who regularly backpacks and hitchhikes through Ethiopia said she was in the Istanbul airport shortly before the attack June 29 that killed 45 and injured more than 200. Later, watching on TV screens the aftermath she avoided by only a few hours, “was eerie and scary,” she said. She finds African countries to be safer than the U.S. and Europe. In fact her biggest concern is pickpockets. “While Africa isn’t immune to terrorism, most violence occurs in small villages that a tourist would never visit. Thanks to ISIS, terrorism across Europe takes place exactly where tourists would end up,” said Bowden. Sentiments like that have helped send down stock in companies that sell packaged vacations to major cities in Europe, with Thomas Cook down 47 percent and TUI down 32 percent since the beginning of the year. The travel and lodging industries have been forced to make steep discounts in an attempt to coax back customers. Experts note that the price wars started after a 14 percent drop in Chinese demand following stricter rules in the country on “gifting,” or bribing officials with foreign-bought luxury items. 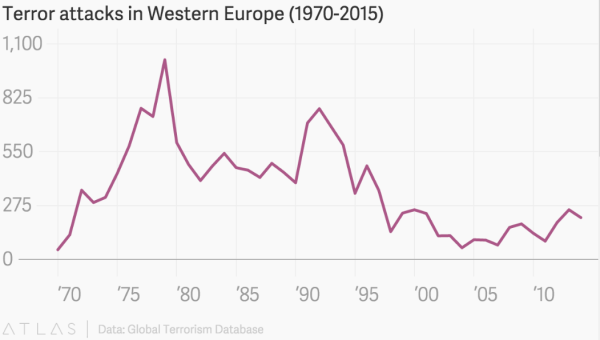 But tourists frightened by terrorism have exacerbated the downturn. Across Europe, hotels are offering discounts of up to 20 percent. Airfare to Europe from the U.S. is near record lows for recent decades. The cost of a ticket to Paris is down 15 percent from a month ago compared to being up 10 percent last year, according to deals surveyed by PromotionCode.org. 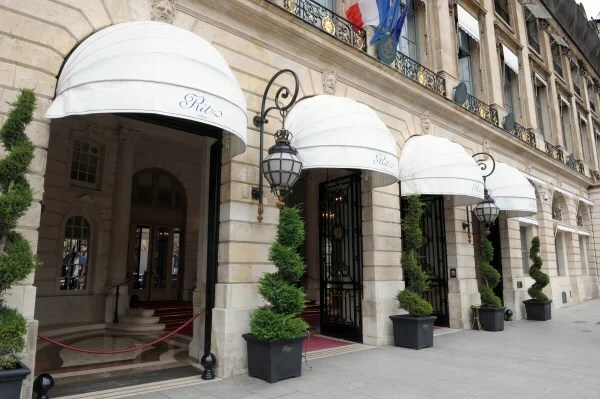 For some travelers, like company CTO Mike Catania, who is heading to the Bordeaux region of France next month, the savings are worth the risk. But nothing lasts forever, especially when it comes to airline ticket prices. Later this year some airfare deals will evaporate as airlines begin removing capacity after the start of their winter schedule on October 26. The recent spate of terror is a decided spike for events in recent memory. But it pales in comparison to the thousands of terror attacks seen in the 70’s, 80’s and 90’s, which saw an average of 10 attacks per week. Terror attacks in Western Europe from 1970 to 2015. There have been over 16,000 attacks in Western Europe since 1971, according to the Global Terrorism Database. That’s an average of 350 per year. The highest number of deaths came in 1988, a total of 440, largely due to the Pan Am flight 103 bombing over Lockerbie, Scotland. And 2004 saw the highest number of wounded, 1,853, after the attacks in Madrid, Spain. So, if history is a guide, tourism will come back, said Yeganeh Morakabati, an associate professor at Bournemouth University in the U.K., who studies the relationship between tourism and terrorism. Her data shows predictable dips in annual arrivals following attacks in years past in Egypt, the U.K., and Spain. Numbers there eventually recovered to what they were before, then surpassed them. 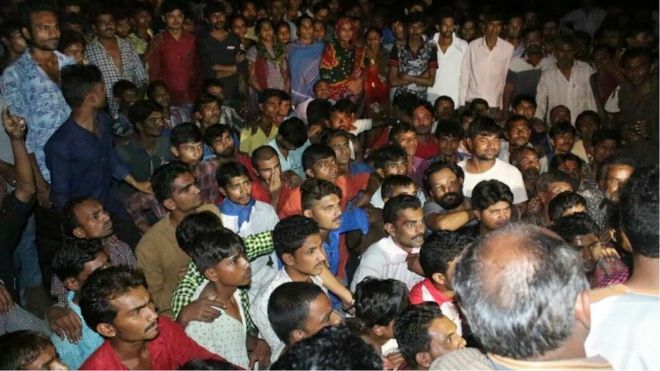 Tension has gripped parts of the Indian state of Gujarat after reports that seven men from the low-caste Dalit community had attempted suicide. The men tried to take their own lives to protest against last week’s assault on four Dalit men allegedly by the members of a Hindu hardline group. The Dalit men were assaulted while trying to skin a dead cow. Last year, a Muslim man was lynched by a violent mob that attacked his house over allegations that his family had been storing and consuming beef at home. There have several other attacks across India where Muslim men have been accused of eating or smuggling beef. Protesters set government buses on fire on Gondal, Dhoraji and Junagadh highway on Monday and blocked a national highway and seven men allegedly took poison at separate protest rallies by Dalit groups, police said. A senior police official told BBC Hindi that a large number of policemen have been deployed in the region and the situation is under control. Last week, four Dalit men, believed to be tannery workers, were stripped and beaten with sticks by men claiming to be “cow protectors”. After a video of the assault was released on the internet, eight attackers were identified and arrested. The victims are reported to be severely wounded and are recovering in hospital. Gujarat Chief Minister Anandiben Patel has said that her government was committed to protecting the Dalits and ordered an inquiry into the incident. Four policemen have been suspended. 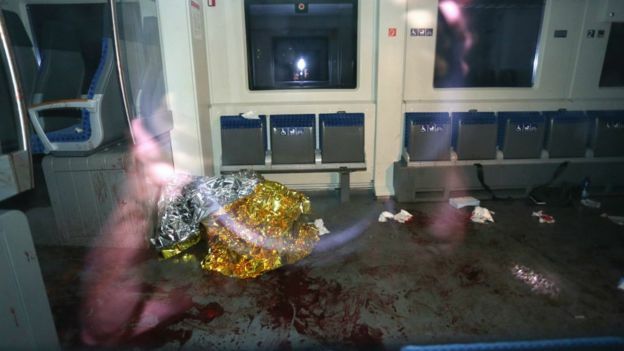 The 17-year-old man injured four people from Hong Kong, two critically, in the attack in Wuerzburg on Monday evening. He was shot dead by police as he fled. He had reportedly shouted Allahu akbar” (“God is great”). The attack comes days after a deadly IS-claimed attack in Nice in France. Joachim Herrmann, the interior minister of the state of Bavaria, told German TV the flag had been found among the teenager’s belongings in his room in the nearby town of Ochsenfurt. Mr Herrmann said it was too early to say whether the teenager was a member of an Islamist group or had become self-radicalised in recent times. The teenager, who had claimed asylum after travelling to Germany as an unaccompanied minor, had been living with a foster family after moving from a refugee centre in the town. Last year Germany registered more than one million migrants, including more than 150,000 Afghans, although the number has slowed dramatically this year since new EU measures were taken to stop the flow. The South China Morning Post said it was believed the four people injured were a 62-year-old man, his 58-year-old wife, their daughter, 27, and her boyfriend, 31. 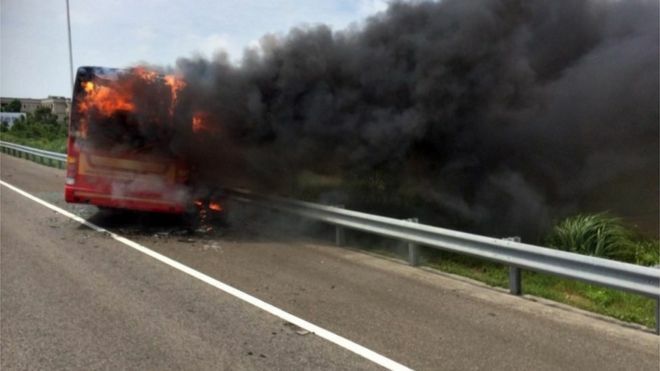 The 17-year-old son travelling with them was not hurt, it said. Hong Kong Chief Executive Leung Chun-ying has condemned the attack and expressed his sympathy to the victims. Immigration officials from the city will accompany family members to Germany. 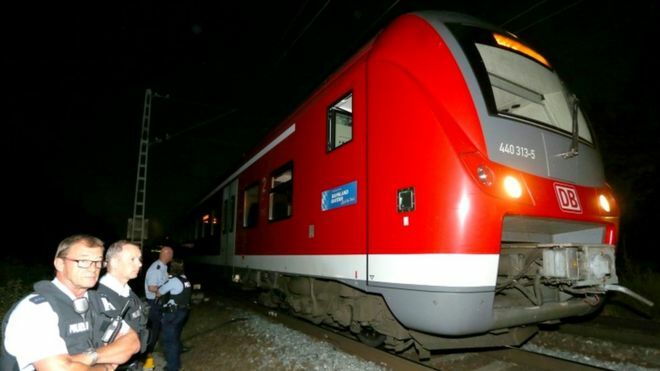 The attack happened at about 21:15 (19:15 GMT) on the train which runs between Treuchlingen and Wuerzburg. The BBC’s Damien McGuinness in Berlin says there is nervousness in Germany about attacks by Islamist extremists following the attacks across the border in France. Islamic State said one of its followers had carried out the lorry attack in Nice that killed 84 people on Bastille Day. 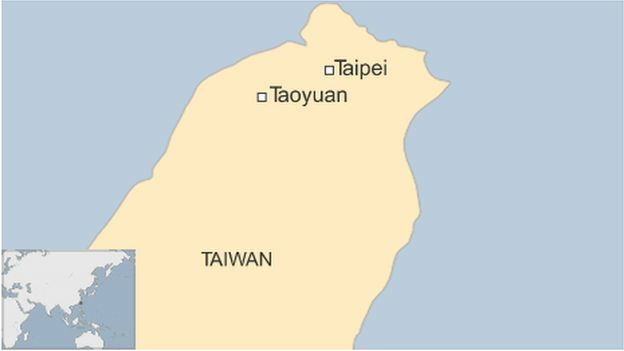 At least 26 people have died after a tour bus caught fire in Taiwan’s Taoyuan city, according to local officials. 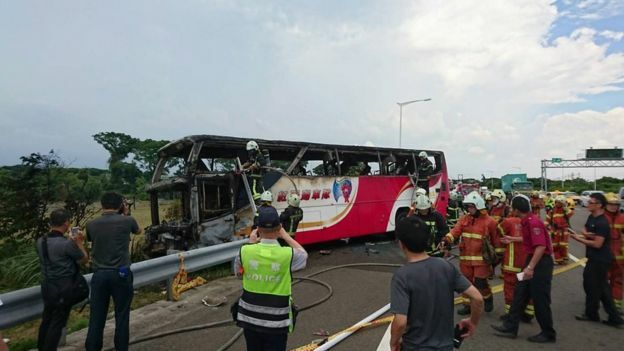 The bus smashed into a roadside barrier on a national highway and caught fire, Taiwan’s Central News Agency (CNA) reported. “The fire moved very fast. All 26 died,” Lu Jui-yao, an official with the National Highway Police Bureau told Reuters. Donald Trump’s wife, Melania, took centre stage on the first day of the Republican National Convention but faced accusations that a portion of her speech plagiarised Michelle Obama. Commentators noticed similarities with Mrs Obama’s 2008 convention speech. Mrs Trump’s speech also praised her husband as a “compassionate” man who would “fight for the country”. Mr Trump’s communications adviser Jason Miller issued a statement saying: “In writing her beautiful speech, Melania’s team of writers took notes on her life’s inspirations, and in some instances included fragments that reflected her own thinking. Meanwhile Mr Trump himself described her speech as “absolutely incredible”. Will Gibraltar end up as part of Spain after Brexit? According to NBC News, more than 95 per cent of Gibraltar residents voted to remain in the EU in the 23 June Brexit vote — the highest proportion of any British region. The enclave has arguably the most to fear from losing the right to EU-wide trade and travel. Gibraltarians already complain of excessive checks and delays on the Spanish side of the border, a vital lifeline for trade and tourism. Many also suspect the situation will only get worse as Madrid ramps up the political pressure. Gibraltar is conspicuously British despite its location at the southern tip of Spain, less than nine miles from north Africa. British police wearing tall black hats patrol streets lined with UK stores agaisnt the backdrop of a huge limestone promontory that give the enclave its alternative name, ‘The Rock’. Britain has already said it would be less able to protect Gibraltar’s interests if outside of the EU and Spain has begun muttering about ceasing Gibraltar and making it part of Spain once again.